Thomas Hopkins Gallaudet pioneered education for the deaf in the United States by helping to establish the American School for the Deaf in Hartford, Connecticut, in 1817. He authored The Child’s Picture Defining and Reading Book in 1830 while the principal of that school, then called the American Asylum for the Education of the Deaf and Dumb. Although Gallaudet intended the illustrated book to be used in educating younger students at the institution, he also envisioned its usefulness as a tool for the instruction of all children. 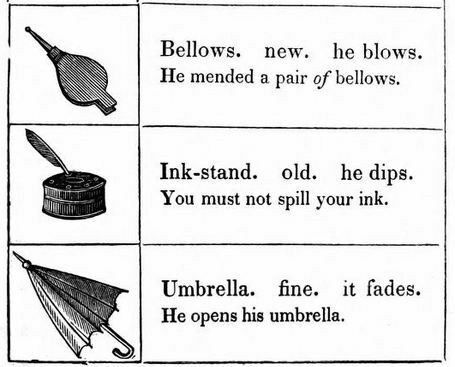 The pictures represented common 19th-century items, or what Gallaudet described as “sensible objects” that would encourage children to connect words and phrases to the tangible world around them. Thus, each image was associated with a noun, an adjective, a verb, and a short phrase to be further described by the teacher. The second portion of the book contained short stories, each with a detailed illustration. Gallaudet advised teachers to let students read the stories on their own, using the images as their guide to unlocking the meaning of any unfamiliar words.